This was not an easy film to make. The physical challenge of filming in scorching hot and humid conditions in the remote, and mountainous jungles of Cambodia and on the Tonle Sap River was sometimes almost unbearable. Ratanak Leng (producer) and I would stare at each other speechless and dream of cold and icy drinks nowhere to be found so deep in the forests. However the hope of one day sharing with the world the stories the families shared with us always encouraged us and made every challenge we faced an opportunity to tell the most honest, meaningful, and inspiring stories we could tell. When we filmed in the Northeastern jungles of Cambodia, we hired and packed nine motorcycles with our equipment, food, water, and a small generator to provide power for uploading footage onto our hard drives. 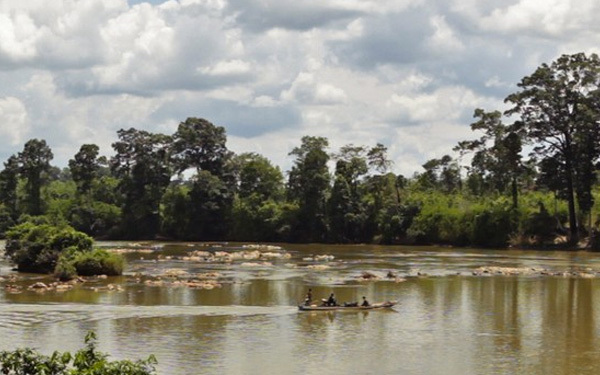 We placed the motorcycles on boats, crossed a tributary of the Mekong River, and climbed nine mountains to reach Sav Samourn and her family living in the deep jungles. There, we trekked through thick forests, bathed in the local spring, and slept in a small hut where the family stored their rice grains and chickens. We dreamt of ice-cold drinks, long showers, and the hot and delicious sour fish soup that awaited us at our favorite restaurant in Stung Treng. 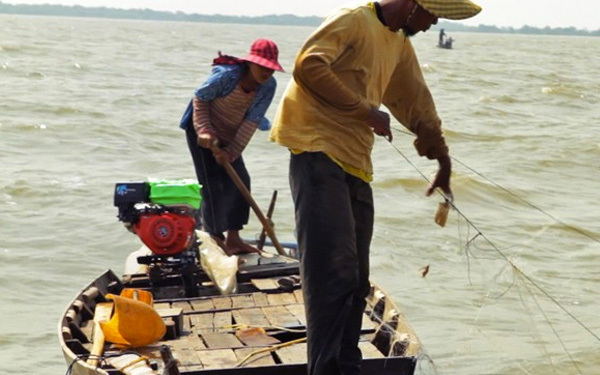 In the floating village on the Tonle Sap River, filming Sari and his father on a small, rocking boat in the extreme heat was both challenging and draining. I stored all the camera equipment in a tin box to keep them from getting wet and Ratanak and I managed as best we could to keep from falling into the river since neither of us knew how to swim! But the best part of filming on the river was the floating café that always delivered a nice, cool glass of iced coffee served with plenty of condensed milk, sometimes a half glass full! One of the toughest days of filming with Khieu was when I decided to follow her back home to her village at two o’clock in the morning. I went alone because I didn’t want to bother Ratanak or Piseth to drive me there. We took a motorcycle through the rain from Phnom Penh to Svay Rieng. I used my raincoat to cover up the camera equipment and emerged at the ferry drenched. 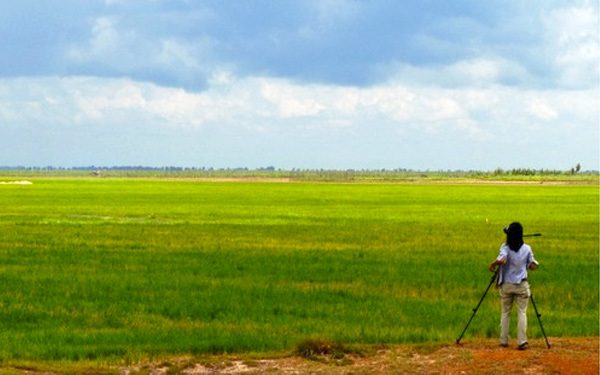 We arrived in Svay Rieng at 8 o’clock in the morning and I continued to film throughout the day in the heat. After that day, I was sick in bed for two weeks! It took us some time to find Sav Samourn and her family. We traveled to three different provinces in the Northeast and spoke with dozens of village chiefs in remote, distant and close villages to the provincial towns. Many of the villages had changed dramatically over the years with the encroachment of companies eager to turn virgin forests into fertile fields of rubber, corn, sugar cane, cassava, and soybeans. 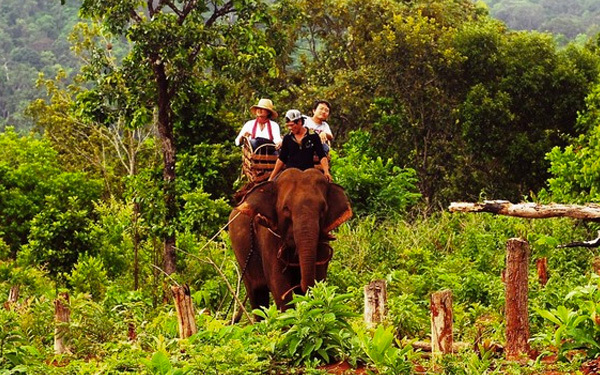 Our journey even took us on an unexpected elephant jungle trek.